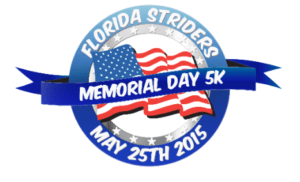 This Memorial Day 5K has very special meaning for our family. After all, it’s the first race we ever ran, all the way back in 2013. How time flies. And now, there we are, back in Orange Park, ready to go for a third time. Obviously, this year, we were older and wiser, with a much better grasp on racing and the 5K in general. My mindset was that this was my last shot to hit a sub30 5K before the real summer began, but it was so hot and humid that morning that I was pretty sure I didn’t stand a chance. We picked up my parents and little man on our way to the race site. They were going to keep an eye on him while we did the 5K and then we would run the mile fun run with him. Parking was ample, as usual, and we had plenty of time prior to the race to use the bathrooms and meet up with friends. The race had a new course this year, so as we lined up at the start line, the race director spent some time reviewing the changes. My plan was just to follow the people ahead of me. We had a moment of silence for those who made the ultimate sacrifice for our country and then the race began. This has always been a nice event. It runs through some local neighborhoods, and it’s always shaded and quiet. It was, however, boiling hot and miserably humid. I did what I could, carefully following all the twists and turns. It was a mistake to grab water at the stop. I was stuck between a rock and a hard place – I needed the hydration but it didn’t hit right, and came right back up. Whoops. It was not a bad 5K, as far as it goes. A lot of corners, but it kept things interesting. Off the top of my head, I couldn’t make out the difference between the new and old courses, so I guess it wasn’t anything too major. Not a PR, but my third fastest 5K, so that was promising. I was a little disappointed, but I just didn’t have it in me that day. I’ll try again when the weather cools down. After our finish, we met back up with the rest of the family to wait for the start of the kids’ fun run. My plantar fasciitis was really acting up, but little man had asked me to run with him, and I didn’t want to disappoint him. After all, it was only a mile, and it was an out and back loop. I figured that if things got really bad, I could let him go ahead of me to the turnaround and pick him up on the way back. There was some walking, but he was consistent and kept up a nice and steady pace. Towards the end, he started to drag a little, but once he saw that finish line, I was able to keep his pace and start “racing” him to the finish line. He loved that and we finished strong. And apparently, in perfect sync. (Now, if only I could do something about that tragic pronation). I love spending our holiday mornings like this. It’s such a rewarding way to start the day, especially when it’s in honor of those who gave so much. Another 5K, rather successfully, logged. I have a clear calendar for June and plan to start racing again in July. I don’t love taking breaks, but sometimes it’s for the best. I hope that we can continue our tradition of running this race for many years to come. What is the race that started it all for you? 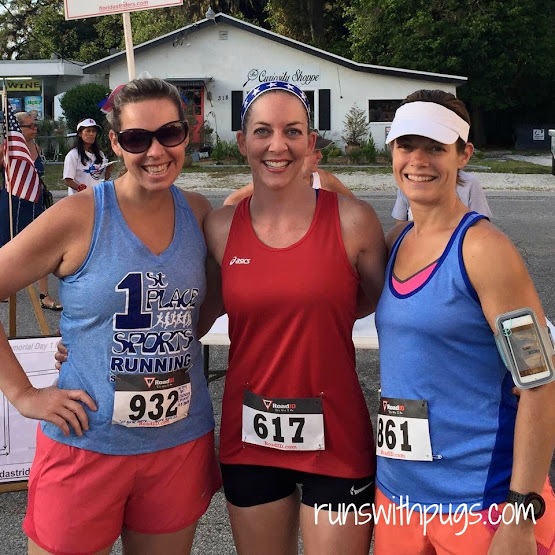 Do you have a race that you run every year for sentimental reasons? I just love that you can all enjoy races together! And that picture with you all synced up… <3 I'm also jealous that so many of your local 5K's give bling! Ours rarely do. My first race ever was the 5K that takes place during the Hartford Marathon. It was HUGE! (And they didn't give medals! Can you believe it?!) I actually never ran that one again, though I did run the relay race one year that takes place at the same time. I'd like to maybe run the half there one year. There is a 5K that takes place in the fall near me that I like to run every year. It benefits a local support group for children that have lost a parent. My younger half brother lost his mom when he was in high school, and that group was so helpful for him. It means a lot to support that race. Ironically I missed it last year to visit the same little brother at his new home. Seemed the only reasonable excuse to not attend. I was registered though, so they did get my donation! Aw, that race sounds wonderful! I am so glad you are able to support your half brother that way! Oh my goodness, that’s so cool that you were able to re-run your first race ever! Girl, I will tell you what, when it comes to running in the heat and humidity I always know that my pace and effort will suffer. I just have to adjust my expectations which can be hard. That being said, no matter what the temperature, I am always glad for a shady course. Also, I just want to say how cool it is that the little man is doing Hunter is with you all. I have such good and then memories of running funruns with my mom when race growing up! I love that we can all run together. It’s not something that ever came up when I was growing up – I don’t know if there weren’t races or people didn’t run way back then. I just never heard of it. Yes, the warm weather can throw you for a loop. I just thinking back to last year when I suffered through lots of miserable long runs, and then when December came, I was like lightning. It makes for such great memories! I had no idea I met you on the day of your first race! And time does fly… I wish I’d gotten out of bed and ran it this year! Right? It’s almost like yesterday! I would love for my girls to do a 5K with me but I think they are still too young. They are 7, 5 and 4. I wonder when is a good time to get them started. You are always such a great dose of perspective. Yes. My time was definitely better than my first (and second) times running. So that’s a plus. Little did one 5K with us in December. He was six. He had been asking and asking and asking and I agreed to it because it was a fun race (read: dog-friendly and lots of walkers and family) and because the weather would be reasonable. We didn’t really train, over and above normal kid activities, but I didn’t think he needed to and I wanted to keep it casual. We did a combination of walking and running. He got very bored partway through mile 2 and it was a struggle to get to the end, but we just stuck with it and kept encouraging him. Both of us stayed with him, rather than worrying about our own times. We made friends along the way to help pass time and eventually, we crossed that finish line. To be honest, he has said that he doesn’t want to do it again until he’s a little older, which is fair. However, he loves the one milers and is getting better and better at them. I’m fine with that that. I say, if they show a strong interest, take them out to give it a shot. I would keep it light-natured and fun and go at their pace. Love the pic of the 3 of you–it’s great this has become a family activity. My sentimental race is Rock n Roll San Diego… My first half (and first race) also in 2013. It’s fun to come back and revisit where it all began! Oh, I love that! Taking on a half as a first race is a bold move, but it’s awesome that you get to revisit it! That picture of the three of you running together is amazing! You should frame that one. Glad you had such fun and were able to do the race again! I wouldn’t say my first 5k started it all, as I let probably 8 years pass between my first two 5k’s and my current running. I just had to look up which race I did first this go -around, so obviously it wasn’t that meaningful. It’s so cool that you do have a meaningful race. Side note: I had a dream I was on a Disney cruise last night. LOL! Not to worry – that picture is already ordered to be added to our wall of medals! I love that picture of the three of you running. 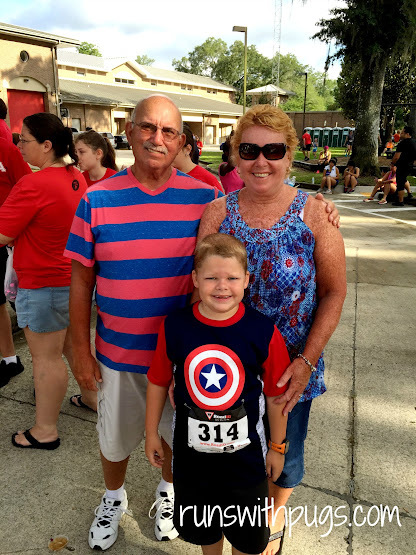 I love it when races can be a true family event! It’s probably one of my favorite race pics. You know I bought it immediately. What a fun family event! The race that started it all for me was a small neighborhood 5k I made my sister run with me. We ran it but then I took a 5 year break before I ever raced again. Go figure. Aw! A few commenters have mentioned taking long breaks between their first race or two and now. Very interesting how that works! awww, this post melts my heart! 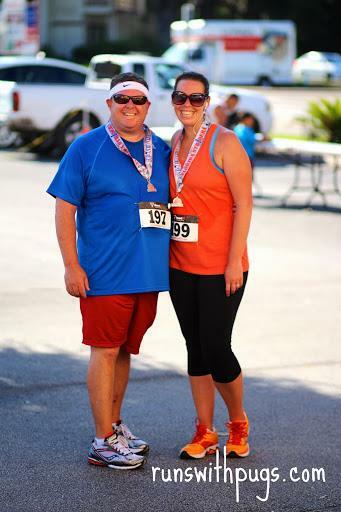 what a great way to share your love of running together. Your photos are so cute! 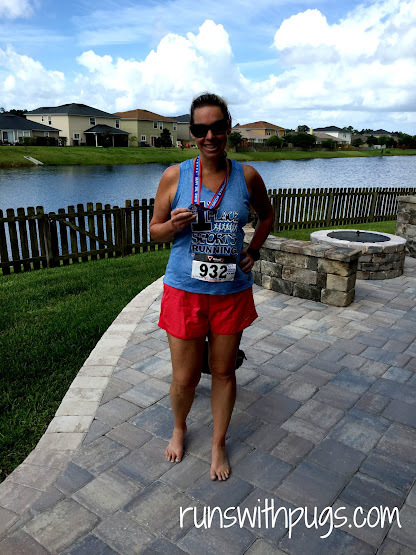 Mar @ Mar on the Run recently posted…Friday Five: Favorite Summer Activities! Thank you! I love that we get to do this and that we all enjoy it! Sounds like fun family time! We have a 5k that goes through our neighborhood and we run that most years. The boys whine the whole time though (yeah, we make them run/walk the whole thing). I wish they had a one mile kids run with it. I think the kids would enjoy that more. Almost all the races around here offer a fun run for the kids. Some of them are free and some of them are a small fee ($10-15), but I think it’s a fabulous, low-pressure way to get the kids involved. Little man’s first 5K was tough for him. He did it and I’m sure I could get him to do it again, but for now, the milers seem to be where his head is at and I’m ok with that. There is plenty of time for longer distances. What a fun tradition! Seeing the finish line has a way of making you find that last push to finish strong. Love that! Yup. I especially like that this one isn’t too far from the last corner. Sometimes, seeing the finish line way off in the distance can be a real buzzkill. Great recap. I don’t have a race that started it all for me… or one that we do every year. BUT… I do look forward to starting that tradition with myboys soon. It’s definitely a great tradition to start! It’s a wonderful tradition to start! What a great race and love the family involvement! What part of Florida are you in? My family will be in Ft Lauderdale area over Christmas and looking for a 5K or fun run. I used to live down that way! We are up in the northern parts, now, so I’m not sure of fun races down there. I’m sure there are a bunch. You can check http://www.runningintheusa.com for more specifics. They have a ton of races in one central location. I’m new to the group so this is my first go-around, and I’m reading a lot about races. I used to be a runner but I don’t run anymore… I will have to run vicariously through the rest of you. Good job on the 5K! I love that this is something you all do together as a family! That sub 3 will come when it cools down a bit here, it is just too hot in May. Thanks for linking up on #TuesdayTales! I love the family running picture. Thank you! Thanks for having such a great place to put all the links! I am trying to get to everyone! You guys look great! You have changed so much. It’s awesome that you guys started running together and that you have this annual race to look forward to each year! Thanks! I am doing a post on where we started and where we are. I am still tweaking it a bit, but it will be up this week.